A week ago I was able to attend the USA v. Guadeloupe game, and I thought I’d just put down some of my general impressions of where we are as a country and our love of the national team. First, the venue was Livestrong Park in Kansas City, KS and it was an amazing stadium. Smaller (18,000 capacity I think), but what a great stadium. It shows how far we’ve come as a country when one of the oldest teams in the MLS is finally able to join the rest of the league and get on board with a soccer-specific stadium and host an international competition. We’ve come a long way since the Hunt family built Crew Stadium. The stadium was packed with 20,000+ fans that night, and it was more encouraging to see the entire supporters section completely filled with the American Outlaws and Sam’s Army (even the local Sporting KC supporter groups came out with their drums and everything to help provide the atmosphere). They really helped set the tone of the game and they never stopped singing the entire 90 minutes. I was also impressed with their pre-game activities. Organized tailgating prior to the game, a get together advertised for the supporters groups the night before to build up the event, it was very encouraging to see. The other three sides of the stadium were made up of a lot of casual or first-time fans. For instance, the group of 48 players and parents that I brought down with me were mainly made up of fans who had never seen a soccer match at the highest level (even on television). A few of them had, but it might have only been to attend one or two MLS games, and watching the EPL or international soccer through a television. So they were very reserved, but I felt like each of them left having a great time and developing a love for this beautiful game. Most of the crowd was relatively quite, and didn’t catch on with the supporters chants, but most MLS games are like this as well in all honesty. The encouraging thing was to notice some of the conversations I over heard throughout the stadium (I can’t sit still, I have to be on my feet for the game). There were a lot of new fans that were very impressed with the quality of play and the excitement around a competition they had only vaguely heard of. 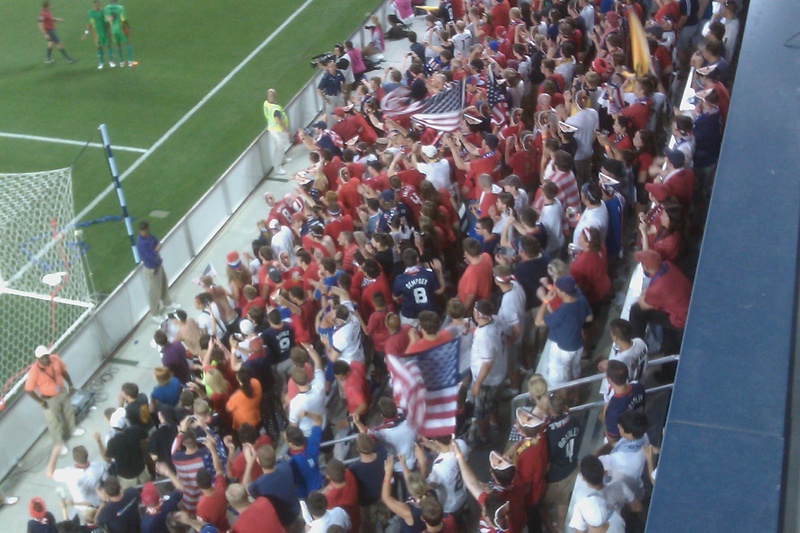 It was very encouraging to me about the future of developing a following for USA soccer. There were a few kids in the stadium, but I would say a majority of the fans were adults who knew something of the game and were educated about the game of soccer and there to watch, not just be entertained. This is what we need for soccer to take off as a spectator sport in the USA. More fans who are adults and can be drawn into the game better than only appealing to the little youth soccer demographic. After the final whistle the supporters groups retreated into the pub and watched highlights of the game as they cheered and had a post-game pint. I think the culture of USA soccer is growing, and it shows with success they’ve had hosting these events. Hopefully we can start turning some of these new, first-time fans into consistent USA followers. It was a great experience, and I’m glad a contingency from South Dakota was willing to drive down and experience it.